finally climate is the deterministic part of the temperature, weather is the stochastic part, and climate change is change in the weather. The worst part is this is actually a central tenet of the BEST methodology. I've kind of discussed this before in comments on this site and others, but I don't think I've ever written a post about it. I might as well do so now. Mosher's comment gives us a great springboard for it. Note that the climate consists of all the variation that depends on location (latitude and longitude) but not on time. If climate does not include variation on time, climate must be constant over time. That means, by BEST's definition, climate cannot change over time. That means, according to BEST, global warming/climate change cannot cause the planet's climate to change. That probably sound bizarre. It is. It's pretty bizarre to define climate in a way which says climate change cannot involve a change in climate. To understand what BEST does, consider the temperature of your house. Let's say your house's thermostat is set at 74 degrees. The temperature of your house won't always be 74 degrees. There will always be temperature fluctuations. Those fluctuations will just tend to center around 74 degrees. That means 74 will be what is known as your "baseline." If you want to examine the temperature fluctuations, it is simplest to subtract out that baseline. We could do the same thing for a city, a country, or even the entire planet. If we're not interested in the long-term average, we can remove it so it is easier to see what we are interested in. And we don't have to do this with a single baseline value. Each room of your house might have a different average temperature. We could treat each of those averages as its own baseline value, removing it for only the room it applies to. We can do the same thing with the planet. Each portion of the planet can have its own average temperature we treat as a baseline value which gets removed. That is the "climate" BEST refers to as C(x). That is the climate Mosher says is "determistic." BEST looks at the long-term average of the planet's temperatures from 1900-2000 in each location, assigns those as baseline values it calls "climate" and removes them. Whatever is left gets labeled "weather." Imagine if you did that with your house's temperature. It might work if you left your thermostat at 74 all day. The average temperature of the house would be 74, which you could call your "climate." Any variations from 74 would be labeled "weather." That could work. But what if you didn't leave your thermostat at 74 all day? What if at noon you set the thermostat to 72? That would cause a long-term change in your house's temperature. For the first 12 hours of the day, the average temperature of your house would be 72. For the last 12 hours of the day, the average temperature would be 74. For the entire day, the average temperature would be 73. Under BEST's approach, you might say the day's average was 73 so that is your house's "climate." Your "weather" is then any variation from 73. That means for the first 12 hours of the day, your weather would be -1 plus whatever random fluctuations there might have been. For the last 12 hours of the day, your weather would be 1 plus whatever random fluctuations there might have been. That might sound rather silly, but it gets worse. What if the question you were interested in was, "How much was the thermostat changed by?" or, "How much has the planet warmed?" Normally, we answer questions like that by separating out long-term trends from short-term fluctuations. That's not what BEST does. BEST throws long-term trends and short-term fluctuations into the same variable, a variable they call "weather." They just remove a baseline value, or "climate," from the data first. If that seems weird, it's because it is. According to BEST, any long-term change in temperature for an area is "weather." That means if the temperature of your area has increased by two degrees in the last 200 years, that's just "weather." When the planet comes out of an Ice Age, that's just "weather." According to BEST, the planet's "climate" isn't something which can change over time. According to BEST, climate change cannot change the "climate." According to BEST, the "climate" is not the long-term average of weather. According to BEST, the planet's "climate" is just the average temperature of the planet from 1900 to 2000. No matter how much time may pass, Earth's "climate" can never change because, according to BEST, Earth's "climate" is only the average state of the planet from 1900 to 2000. Put bluntly, I think that sounds insane. And I'm okay with that. There are a number of mathematical concerns I have with the approach (like how the choice of an arbitrary baseline affects the results), but I'm actually okay with the seemingly absurd definitions. I'm okay with it because sometimes we use words in unusual ways. Sometimes it is just easiest to use a word in a way people within a group will understand even if it sounds strange to people outside that group. That's what we have here. BEST, to its credit, clearly defines what it means by "weather" and "climate" in its papers. People familiar with the papers should have no trouble understanding what the papers mean when they say "weather" and "climate." And for people not familiar with the papers? That's easy. When referring to the papers, people can just quickly explain the unusual ways they're using "weather" and "climate" so everyone knows. Which makes absolutely no sense outside the context of BEST's unusual terminology. Nobody reading Mosher's comment could possibly be expected to understand it. He didn't try to help them understand it. He just said something he knew nobody should be expected to understand - that climate change is not a change in climate. He said this despite knowing the only way it could possibly make sense to anybody is if they redefine the word "climate" to mean something it doesn't actually mean. Why? I don't know. I try not to guess at people's motivations. What I do know is I've seen Mosher, a representative for the Berkeley Earth Station Surface Temperature (BEST) project, repeatedly insult people for not understanding things related to climate change. So remember folks, if you use "weather" to refer to weather as you've understood it for your entire life, you're an idiot. If you think "climate" is the long-term average of weather, you're an idiot. If you think "climate change" involves a change in the climate, you're an idiot. If you don't redefine words on nothing more than the unstated whims of the BEST team, you're an idiot. That is what Steven Mosher, our neighborhood BEST representative, wants you to know. its actually one of the two definitions of climate. For example, when you look at Koppen classifications he is talking about one definition of climate--a spatially focused one.That is essentially how we define climate FOR THE PURPOSE of doing our estimate. It's defined that way by CONSTRUCTION. In this definition of climate , climate is that portion of the weather that is determined by geography. For example, consider the phrase "tropical climate". The other definition of climate is "long term weather average". It's become vastly more popular and has its uses like all defintions. But folks shouldn't be too tied to popularity, when other approaches may prove more useful. So we use the alternative spatially focused definition. One problem with the time focused version is that "long term" is somewhat arbitrary, if we change the time, the climate changes. That leads to nasty fights about the length of time periods. What's normal for the earth? you can see the spatially focused definition if you just read around a bit. In fact, before I was exposed to the spatially focused version I was pretty vocal about the "climate as long term weather" version. Reading around is a wonderful way to learn. He is not talking about the long term average of weather near the ground. He is talking about the kind of climate we refer to: climate as determined by physical geography. 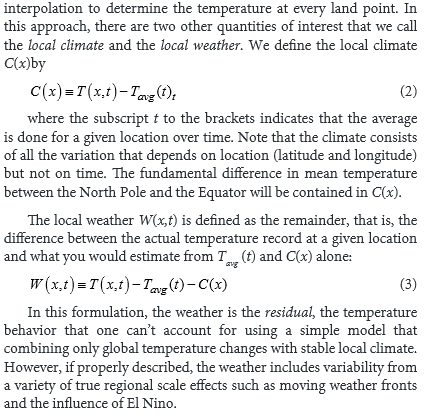 Defining climate by construction as we did is actually pretty normal in the spatial stats world. Steven Mosher, the argument you offer is wrong to the point of inanity. There is no purely spatial definition of climate. The supposedly spatial definition you refer to also has a temporal component. BEST shows this by picking a single period for its baseline (1900-2000). Any other spatial definition would require the choice of a period as well. And this is every bit as arbitrary as the issue of how long "long" is, which you cite as a reason for not defining climate as the long-term average of weather. The bizarre thing is everybody knows a long-term average of weather requires both a spatial and temporal component. The definition you promote here uses both a spatial and temporal component. The two are actually the same thing. You've just created a false dichotomy which does nothing to defend BEST's methodology/terminology. Defining the planet's climate as the long-term average from 1900-2000, which is exactly what BEST did, is strange in any casual conversation, and it is wrong unless you make the distinction between your non-standard usage and the more normal usage. And it is always wrong to insist other people use your non-standard terminology when they have no reason to. TL;DR: It is stupid to argue there are separate temporal and spatial definitions for climate Mosher. Climate requires both spatial and temporal components. And to head off more of Mosher's stupidity, pointing out climate can be used without referring to a long-term average in weather is stating the obvious and irrelevant. Climate can refer to all sorts of things, including ones the emotional state of a room. It'll still have a spatial and temporal component. The reason I referred to climate as the long-term average of weather is we were talking about climate as it relates to weather. Had we been talking about a different use of the word climate, or even just the use of the word in general, I obviously wouldn't have said climate is the long-term average in weather. This sort of thing shouldn't need to be said, but since Mosher wrote so many words to seemingly try his hardest to misunderstand simple points, I thought I'd point it out. I wouldn't use the word stupid. I would apply equivocation. The climate of England differs from the climate of the Aleutian Islands, even though both are islands, in oceans, at about 50 degrees north. To say they have the same climate, and the well-understood long-term differences are differences in "weather" (or "usual weather" or "average weather" or "normal weather") rather than "climate" is to define what climate means in drastically unusual way. So, to then pronounce that "the climate is changing" becomes a completely different claim -- using the new definition -- than either policy makers or laymen are going to understand. Given that we enjoy the "expected average normal usual weather" of English and hearing that the "climate" in that location may be something other than usual, expected, etc, the layman is going to expect that the change will be other-than-enjoyable, too. This is not, in careful analysis, the actual claim. (And says nothing about the new "average weather" of the Aleutians.) But that a typical policy maker might, with more likelihood than not, run off having misunderstood the actual claim is somewhat more expected, normal, usual, and "business-as-usual" than the likelihood of the claim itself, and associated risks and estimated costs of the claim. It's not, by the way, the policy maker's fault that the word was re-defined by the scientists. Pouncer, I'm not saying what BEST did was stupid (though it is weird). What's stupid is Mosher's response. If you look through his comment, you'll see he doesn't say a thing about what BEST actually did. He doesn't really say anything about anything this post says. For example, when you look at Koppen classifications he is talking about one definition of climate–a spatially focused one.That is essentially how we define climate FOR THE PURPOSE of doing our estimate. It’s defined that way by CONSTRUCTION. In this definition of climate , climate is that portion of the weather that is determined by geography. But geography determines climate by shaping the weather. We determine "the portion of weather that is determined by geography" by taking the long-term average of weather. That's why BEST uses the average of weather from 1900-2000 to determine what it calls "climate." In other words, the two definitions are the same thing. As for why what BEST does is weird, nothing Mosher said has any bearing on that. The reason what BEST does is weird is it defines climate as the average of weather from 1900-2000. That makes it a constant value, meaning climate cannot change. Ever. According to BEST, if you want to compare 1800 to 2010, the "climate" for both is the same. It's weird, but it is internally consistent. It's just not something you should ever expect other people to use in casual conversation, like Mosher insisted people do over at Climate Audit.